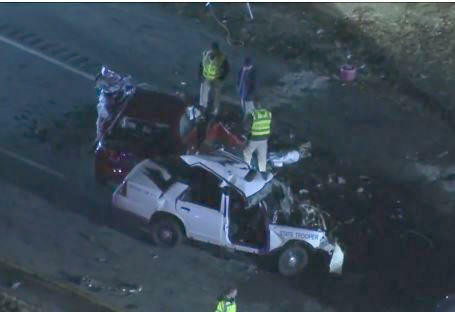 MILLVILLE, N.J. - A New Jersey state trooper and another man were killed in a head-on highway crash. It happened around 7 p.m. Monday on State Route 55 in Millville, in the southern part of the state. A man traveling southbound in his Toyota Corolla crossed the grass median, entered the northbound lanes and crashed head-on into a marked state police vehicle. Trooper Frankie Williams was on duty and responding to a call at the time of the collision, state police said in a statement early Tuesday. The unidentified man was pronounced dead at the scene. Trooper Williams, 31, was flown to Cooper University Hospital in Camden, where he was pronounced dead, state police said. News helicopter video showed the mangled cars and debris littering the roadway. The crash remained under investigation early Tuesday. CBS New York reports that there was a solemn salute from fellow state troopers as Williams’ body left the hospital. State police said Williams, of Atlantic County, was a member of the 156th State Police Class, which graduated January 29, 2016. He was assigned to Port Norris Station.